To celebrate the opening of The Jazz Age: American Style in the 1920s, this Object of the Day is dedicated to design now on view in the exhibition. 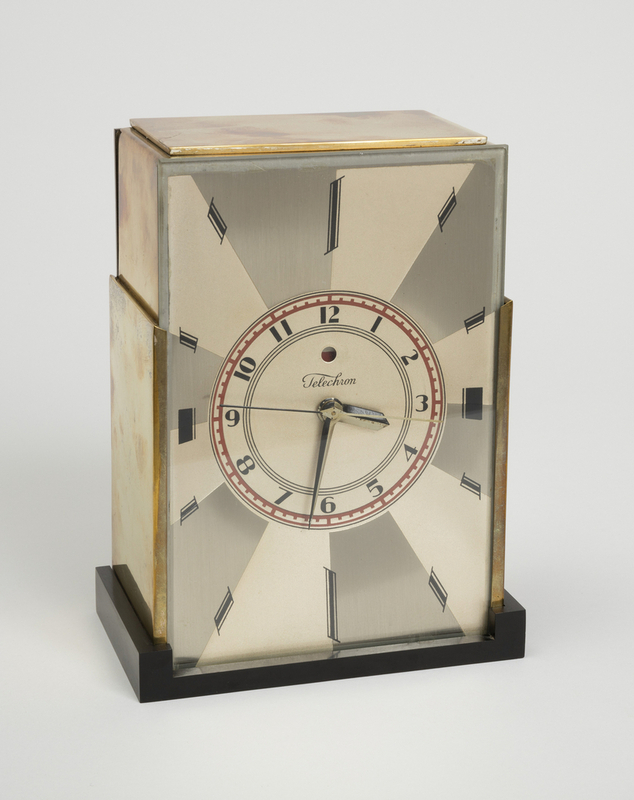 Paul T. Frankl’s 1928 clock design for the Warren Telechron Company—marketed as the “Modernique”—perfectly coincided with American consumers’ burgeoning interest in modern design. That same year Frankl published his first book, New Dimensions: the Decorative Arts of Today in Words and Pictures, in which he discusses the intrinsic relationship between modernism and furnishings, interior decoration, architecture, and art. The first chapter (aptly titled “What is Modern?”) begins: “Modern is only a relative term. New things may be old-fashioned and they may be modern. But for that matter old things may often be considered very fresh. How can this be? The answer is simple. Different times and different countries have their own ideals of beauty.” The form of the skyscraper was Frankl’s own ideal of beauty—he is best known for his “skyscraper” furniture in the mid-1920s—since it was brazenly American and captured the spirit of modernism during the 1920s. The Modernique’s metal case softly renders the skyscraper’s stepped form, exemplifying Frankl’s adoration of it. The Modernique was one of the company’s first modern designs and the only one to be designed by Frankl. It was made from 1928 to 1932 and in three variations: Model 431 had a brushed silver finish, Model 431A (seen here) had a brushed gold finish, and Model 431B had a black and purple “Chrome Enameled” finish. The dials were decorated with red or blue details and the trapezoidal “ray” decoration on the clock faces varied in color and detail. The small circular opening beneath the 12 on the dial, sometimes marked with a red dot, is an innovative and noticeable characteristic of all Telechron clocks from this period. These openings were power loss indicators created by the company’s founder, Henry E. Warren (1872–1957), who had invented the “spin-to-start” electric clock, which would automatically restart itself after a power outage. The red dot would appear in the opening after an outage to alert the owner the clock needed to be reset. These power loss indicators were used by other companies, such as General Electric, which acquired half of Telechron’s interest in 1917. Easily overlooked today, the significance of this detail is a reminder of electricity’s unreliability during the early 20th century. Frankl’s next book, Form and Reform: A Practical Handbook of Modern Interiors (1930), has a chapter on “Form and Function” in which he writes, “Today there exists a conception of functional beauty…but we are still far from having established any underlying principles that govern functional style.” The rectilinear form of Frankl’s metal-cased Modernique differed greatly from Telechron’s traditional wood-cased designs in the late 1920s, showing a different conception of functional beauty. Frankl’s modern look provided the perfect form for Henry Warren’s ingenuity in timekeeping. This clock is currently on view in The Jazz Age: American Style in the 1920s. Catherine Acosta is a graduate student in the History of Design and Curatorial Studies program offered jointly by the Parsons School of Design and Cooper Hewitt, Smithsonian Design Museum. She is a Fellow in the museum’s Product Design and Decorative Arts Department. Jim Linz, Electrifying Time: Telechron and GE Clocks, 1925-55 (Atglen, PA: Schiffer Publishing, 2001), 67. Paul T. Frankl, Form and Reform: A Practical Handbook of Modern Interiors (New York: Harper Brothers, 1930), 42.